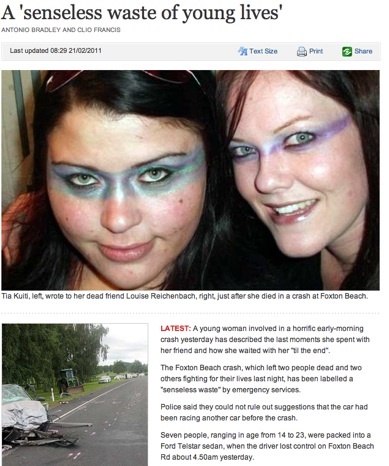 I don’t know the background, but I observed this morning that a young woman’s lament on Facebook about her friend’s death in a car crash was reproduced on a news website, along with a photo purportedly of the two of them from the young woman’s FB profile. The car accident, described (accurately) as a ‘senseless waste of young lives’ happened over the weekend, with 7 young people in a 5 seater car which rolled and crashed … two dead, two injured. Here we are Monday morning and some news reporters are (apparently) trawling through the survivors’ FB pages — as if that’s a development in the story? It seems a bit off to me. LATEST: A young woman involved in a horrific early-morning crash yesterday has described the last moments she spent with her friend and how she waited with her “til the end”. Then, the story quotes the survivor’s lament/farewell to her friend in full, except for a censored swear word. Yes, I know, before you say it, I know this survivor’s FB page is open to ‘everyone’ i.e public, (for now) but even so, … it feels a bit like quoting from someone’s diary, doesn’t it? She has her profile open and viewable to the public – the media are the public, so in a sense they have the right to use that information however they see fit. I just looked up the profile. Prior to reading your blog post, or seeing that profile, i had not paid any attention to this story…it was just another car accident. Seeing the face, of the girl that needlessly lost her life, has made me want to hug my daughters, and keep them that much safer. My biggest fear, when they go out at night, is that they will get in a car with someone they don’t know very well, and end up like this. I will show them this story. I think if anything – this time – the media doing this is a good thing. Yes I had exactly the same ‘clutch my teenage daughter’ alarm-response as you did. Exactly. I’m equally afraid of her exposure to the recklessness of teenage drivers and over-crowded cars and social pressure to take risks like this. It’s a ghastly true-life story — a Saturday night which ended badly at 5.30am on Sunday morning. Two families have lost kids, and two are in hospital. So much suffering and grief. I agree with you (and the reporters) that there may well be a positive impact from the reproduction of this material from FB. …. sheeting home a lesson of grief, sounding a warning. Good things from a bad situation. But does the end justify the means? I’m not sure. If feels like a slippery slope. If they had her permission, OK.
How did you feel when your ‘private’ FB info was published in far less newsworthy circumstances? nah, it’s nothing like a diary. facebook is intentionally public fodder and what you say on it is measured by that, whereas a personal diary is not. if a person wants to lament the death of her friend on facebook then she does so aware of the consequences. it’s not like it’s hate speak, it’s generation y (and all other gens following) and a reality. the real problem is in the mind of the reader because “through presumption comes nothing but strife”. As boomers we will need to learn to take more on face value and especially those of us who are closet shrinks … just like in the newspaper or on the tele … most of what goes up on facebook should be seen for what it is and not overworked or pseudo reintepreted by the reader. Thanks for your comment Trudy. Sure. Maybe I just need to ‘get with it’ and not take it so seriously. I felt ‘queasy’, I said, about this use by the news media, not outraged. As for “aware of the consequences” … Well, no, I’ve not forgotten my own teenage INABILITY to perceive potential consequences from my actions. Like this group: 7 jammed into a car (Speeding? dunno. Out of control? Yes) — One of the deceased flung from the car as it rolled, the other, this poor girl, trapped in the footwell of the car where she’d been ‘sitting’ after the crash and dying trapped there. The Herald understands Miss Reichenbach, a recently qualified occupational therapist, was sitting in the front footwell of the car, next to the front-seat passenger and the 19-year-old driver, when the crash happened. Four others were crammed into the backseat and at least one, a 14-year-old boy who also died, was flung from the car when it rolled several times. While police are still trying to determine exactly what happened, they say speed is believed to have been a factor and there may have been another car nearby at the time of the crash which is yet to be located. I am in both camps. However I am not defending the Media, I point my blame more on the users. If the users Security settings are locked down to specific users, I think the media have not right to publish anything, no matter how they come across the info. How are they to know this? Well do some research first. However I think majority of Facebook users are naive, they believe no one will see what I write. I personally have my Facebook Profile locked down to the max levels and I always check that they again have not changed anything. e.g do you know you can now use https: for Facebook? However I don’t publish things that I don’t want everybody to know. 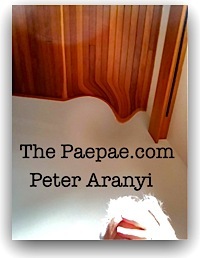 Peter I agree the Media are slack, in the US, news reports they use Twitter Posts as late breaking news. And like you this behaviour makes me queasy. Thanks Craig, yes, that seems a sensible approach. I don’t think either of us is a teenager (correct me if I’m wrong about you!) … and that’s the point. These kids (ahem) are “publishing” all sorts of stuff without a clue a proper grasp of the possible consequences. They’ll suffer them. Yes agreed Trudy, that experience is the greatest teacher. That’s natural, as it is ALSO natural to want to protect people we love from the sometimes trivial/sometimes catastrophic results which will follow — unanticipated (by them) — from their actions. On the issue of media ‘exploiting’ teen or other naïveté — I’m with Craig. Queasy. A justification like, ‘Well you *published* that remark’ (or that photo of you in your underwear/with the goat/drunk as a skunk in Courtenay Place/in a motel bed with those work mates etc etc) doesn’t wash with me. But I’m not extruding the argument to the point of wanting a law or a code of practice …. just saying it feels ‘off’. Facebook is like leaving your door unlocked and going to sleep, you might wake up with a fox rummaging through your bin bags in the kitchen which you meant to put out but left until morning, you might get burgled by smackheads or you might find Paris Hilton presenting you with a lottery cheque and a brand new Rolls Royce. I think the first two scenarios are more probable. What gets me is that I wasted time on CH, I can’t believe that such a phillistine who has never read Joyce or Flaubert, never heard Bach or Mozart, never known the difference between a weed or a potential bloom was trusted to ‘advise’ people. At least when I interviewed people, I never gossiped about them on facebook or twitter. I certainly never described ‘clients’ as ‘lazy’. Poor show and that’s my final word on this matter, manners cost nothing.